Managing multiple websites separately can be a pain for a marketing team. With different logins and possibly dealing with different content management systems, it is hard to create a cohesive multi-site strategy. A multi-site web system simplifies things. You use one login to access all sites. 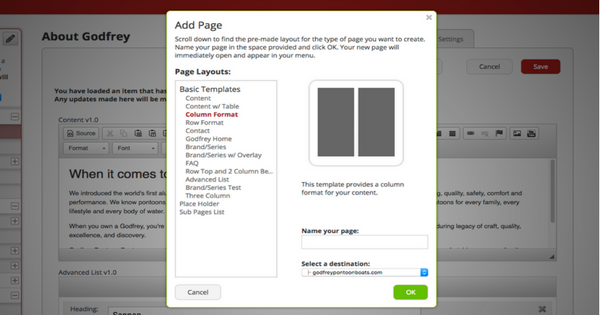 Under one account, you are granted the power to edit, add to, and modify multiple domains as you wish. The layouts, promotions, content of any site is congregated on one single online interface. No switching between sites and multiple logins is involved. You can still keep sites and their individual purposes and content separate with different domains while keeping your brand’s uniqueness across all sites. Both Hurricane Boats and its sister-site Godfrey Pontoon Boats have a similar theme and style. This allows users to quickly find the boat information they are interested in. Let’s take a quick look at the shared features of these beautiful sites to see the benefits of multi-site management in action. Each site’s home page features an eye-catching home page rotating image gallery that showcases the boat models and provides a quick link to their page. The team can easily update and re-order any of these images, therefore, keeping the site fresh and current. 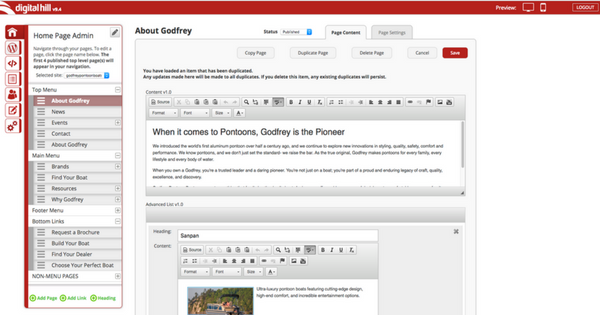 Using Godfrey Pontoon Boats as an example, we can see how easy it is to promote events and sales with the system. The site has a special area right below the boat models section for promotions and sales. This highly visible area is easily updated at any time with the system. So it can be kept current throughout the year. The Build a Boat tool lets visitors build their dream boat within an affordable price range. This is a powerful tool that gives users a reason to stay on your site longer. They can literally select their boat with all the custom color and feature combinations, and then see their boat before they order it! In addition, lead capture is implemented into the tool. Users create an account and save their boat design. In this action, their information is collected. As a result, they can be contacted by a dealer nearest to them. With the Find Your Dealer tool, the move from dream to reality moves is initiated. By providing location and desired boat model, prospects are able to locate dealers near them. Hence, easily to see boats they have in stock or to discuss their pre-select build-a-boat unit. Both sites present its various models to visitors on the homepage with a series of image links. 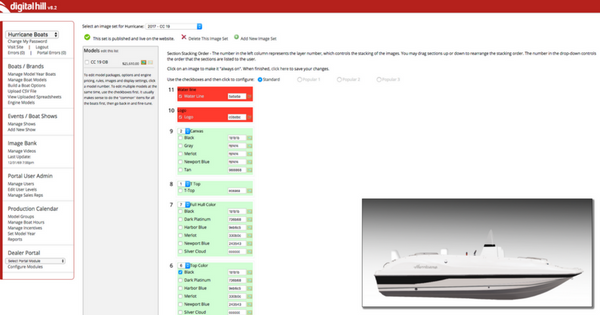 The links take visitors to the Compare Model tool where more detailed information on a boat model can be found. Layouts, a unique description for the model in question, and specs give prospective buyers an idea of what the final product will look like and how the model will serve their needs. Through the tool, a buyer may compare the luxurious Sanpan series pontoon to the family-friendly Sweetwater. Both sites feature a video section to show off the product. The system allows you to update these videos as needed. The beauty of a multi-website system comes is evident when you consider each site’s individuality. Although they maintain some uniformity, they have different feels and styles. Hurricane Boats is all about action and excitement. The design for users who wish to feel “energized, exhilarated and adventurous.” Users feel the urge to hop on the Hurricane and take a ride. 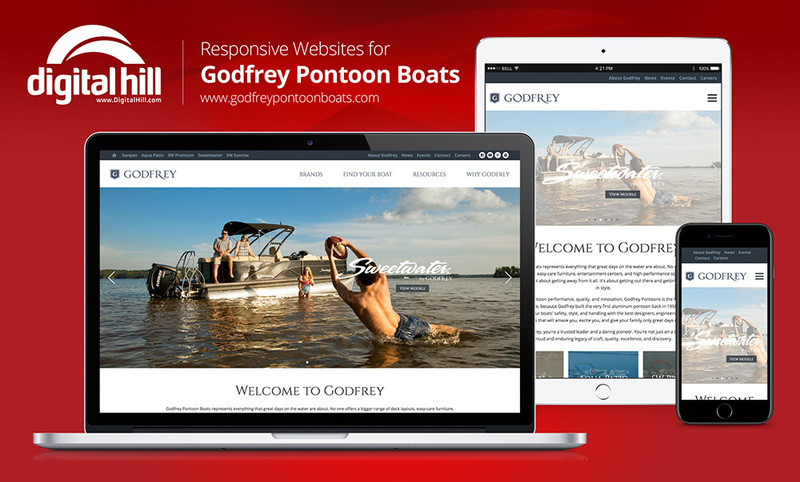 In contrast, Godfrey Pontoon Boats is more subdued with a Cinzel font, a greyish-blue color scheme and an emphasis on community rather than the individual. Using a multi-website system, Hurricane Boats is equipped to get more boats and their new owners on the water. Do you need a multi-website system for your business? Contact us.